CNN's Neil Bennett films Kazak fishermen at work on the shores of the Aral Sea. Editor's Note: Earth's Frontiers explores the conflict between progress and preservation at some of the world's biodiversity hotspots. Watch the show Saturday, May 29 at 07.30, 17.30 and 20.00 GMT; and Sunday, May 30 at 03.00, 07.30 and 15.00 GMT. Aralsk, Kazakhstan (CNN) -- It was one of those moments when almost immediately you realize separating probably wasn't very smart. We had driven 40 kilometers from Aralsk, the old port town, across the dry sea bed, now sand dunes and salt flats, to the shore of the Aral Sea. Our intention was to meet up with local fishermen and film them at work. We found their boats, but the fishermen weren't to be seen. We had been driving all morning and were keen to finally get out of our Russian jeep. Alysen, the producer, and I stretched our legs and then began to take pictures of the sea. Our guide, Serik, said he would drive around and see if he could find the fishermen. An hour went by and he hadn't returned and our remoteness in this vast uninhabited area sank in. Utterly stranded somewhere on the shore of the Aral Sea with no food, one bottle of water and no mobile coverage. We were literally in the middle of nowhere. Fortunately, I had a small satellite phone, so we could always call for help. Unfortunately, we weren't sure where we were, and the GPS was in the jeep. Two hours later and our minds started to race with all the possible reasons he hadn't returned -- had the jeep broken down, or more worryingly, had he had a serious accident? I had visions of us camping out for the night. We anxiously scanned the horizon. Not a sign of anyone or anything for miles. Eventually, we saw a cloud of dust approaching. To our great relief, it was Serik in his jeep. His jeep had gotten stuck in a sand dune. He had been very lucky to meet a passing fisheries department patrol vehicle, which had helped him out. 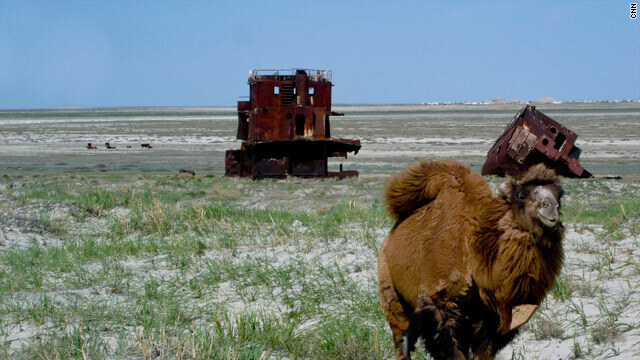 Fishing used to be big business on the Aral Sea in Kazakhstan. That was before the man-made environmental catastrophe that left the sea a tenth of its original size. During the 1960s, planners in the former Soviet Union began to divert its water sources to irrigate cotton and other crops in the region with disastrous consequences. Rusting hulks of the old fishing ships lie wrecked on what was once the seabed, kilometers from where the sea is now. On the last morning of our trip to Kazakhstan, we drove back once more to find the fishermen. It was early, and they were still in their tents by the shore. The fishermen agreed to take me along but not our guide or producer, as it was too windy, and the boat would be unstable with all of us onboard. Being unable to speak Kazak or Russian we had no way to communicate. We just sat and smiled at each other. Sahif, the eldest fisherman rowed the narrow wooden boat. This part of Kazakhstan is a harsh pace to live, and his face was worn, dark and lined. When he smiled, he flashed a handsome amount of gold teeth. He looked old, a wise grandfather figure. I was to later find he was a year younger than me at 41. Eventually the younger fisherman spotted their net, entangled were flounder, pike-perch, bream and one very large carp, all tossed into the bottom of the boat, flapping and gasping. I ended up at the front of the boat unable to move for fish. As the last fish were brought in, the fishermen sang a Muslim prayer of thanks for their good catch. Filming done, I sat and reflected on all our good fortune.